recent developments in literary and critical theory. A prolific writer of essays, short stories, and plays, Borges's concerns are perhaps clearest in his stories. He regarded people's endeavors to understand an incomprehensible world as fiction; hence, his fiction is metaphysical and based on what he called an esthetics of the intellect. Some critics have called him a mystic of the intellect. Dreamtigers (1960) is considered a masterpiece. A central image in Borges's work is the labyrinth, a mental and poetic construct, that he considered a universe in miniature, which human beings build and therefore believe they control but which nevertheless traps them. In spite of Borges's belief that people cannot understand the chaotic world, he continually attempted to do so in his writing. Much of his work deals with people's efforts to find the center of the labyrinth, symbolic of achieving understanding of their place in a mysterious universe. In such later works as The Gold of the Tigers, Borges wrote of his lifelong descent into blindness and how it affected his perceptions of the world and himself as a writer. 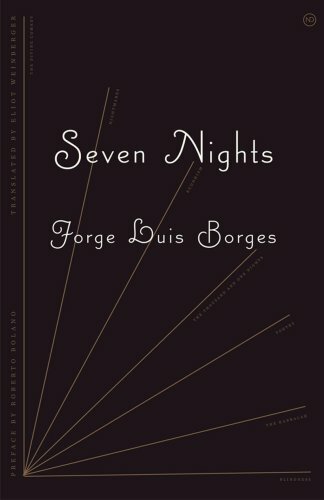 Borges died in Geneva in 1986.
the "20 Best Books of the Year for 2009. He is also the co-author of a study of Chinese poetry translations, 19 Ways of Looking at Wang Wei. In 2000 he was the only American literary writer to be awarded the order of the Aztec Eagle by the government of Mexico.